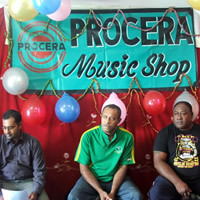 The talents of local artists, the plight of local composers and effects of piracy on the local music industry will be highlighted during this year's week long Procera Music Festival which starts at Syria Park in Nausori from today. Procera Music Shop General Manager Mahid Murad said during the festival people will be able to be to enjoy a variety of music and is calling on the public to come out in support. Ten local artists are expected to be part of the festival which ends next Saturday.